Greenpeace protesters have denied illegally boarding a ship carrying GM crops in the Bristol Channel. Magistrates in Barry, south Wales heard them deny causing a public nuisance and conduct endangering a ship's structures or individuals. The MV Etoile was boarded last week in the Bristol Channel last week to prevent it unloading GM animal feed. Magistrates declined to try the group and there will be another hearing in September for crown court committal. The court heard that protesters on board the vessel were arrested after a police helicopter landed officers on its deck. Other demonstrators were arrested on support vessels in Penarth marina near Cardiff. The ship was carrying a cargo of GM maize destined for dairy farms supplying milk to British supermarkets. John Edwards, prosecuting, told the court that the Etoile, one of the largest vessels in the world, had set sail for New Orleans in the United States. 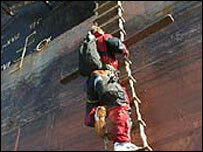 Protesters boarded the ship as it waited for a pilot to navigate her into Avonmouth docks near Bristol. Mr Edwards said: "This was methodically and professionally planned in relation to the setting up of the event. "There were orders dictating the plan and its execution." There are ten men and three women accused. They are: Benjamin Ayliffe, 26, of London, N1; Nicola Cook, 36, of Harleston, Norfolk; Sederick Coumord, 27, of no fixed address; Francis Hewetson, 39, of Kensal Rise, London; Timothy Hewke, 43, of Sittingbourne, Kent; Jens Loewe, 35, of Islington, London. Janet Miller, 48, of Buxton, Derbyshire; Rachel Murray, 30, of London; Michele Rosato, 32, of Bow, London; Andrew Taylor, 34, of Stroud, Gloucestershire; Allan Vincent, 41, of Peckham, London; Richard Watson, 39, of London, N1 and Huw Williams, 37, of Buxton, Derbyshire.